Year to date, the S&P 500 Low Volatility Index® has underperformed its parent S&P 500, up 5.52% compared to a 7.55% (through Aug. 16, 2018 close) increase for the benchmark. 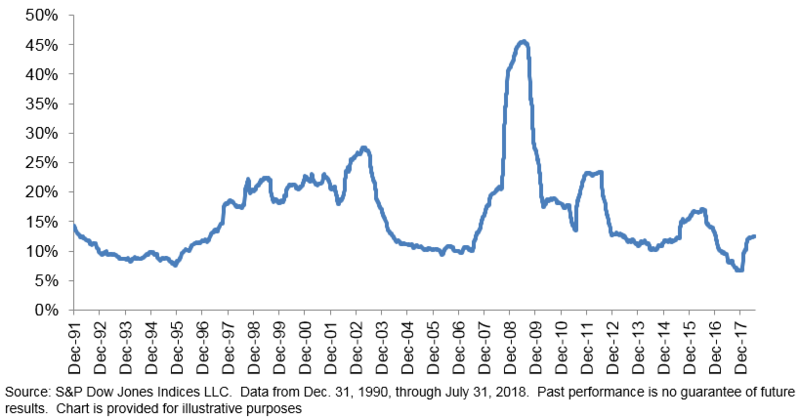 Those who are familiar with low volatility strategies will recognize that this performance is consistent with the historical pattern of returns and in line with its objective. Volatility in 2018 has been higher than in the remarkably sleepy year in 2017. While there’s no denying that volatility has been on an uptrend, current levels are still far below those seen during major calamities. In the latest rebalance (effective after market close Aug. 17, 2018), the S&P 500 Low Volatility Index added 5% to its allocation in Real Estate, bringing the sector’s weight to 18% (the second largest weight in the index after Utilities). This came at the cost of Industrials, whose weight was reduced by half (primarily due to a reduction of stocks from the Aerospace and Defense industry). Surprisingly, Technology added slightly more weight, maintaining a historically-unprecedented position in the Low Volatility Index for more than a year. For insight into the latest rebalance, consider the trailing one-year volatility of sectors within the S&P 500. Volatility crept up across all sectors, by generally similar amounts. Surprisingly, despite the recent turmoil in Technology, volatility there was relatively subdued, inching up only slightly. While the Industrials sector experienced relatively more volatility compared to other sectors, the difference seemingly was not commensurate with the significant weight drop in the S&P 500 Low Volatility Index. Given that the increase in volatility were somewhat evenly distributed across all sectors, it would seem that the allocations from the latest rebalance were driven more by idiosyncrasies at the stock level.